People sometimes ask, where do your stories come from? That’s the million dollar question, because more often than not, we really don’t know. I like to call myself a Story Catcher. The ideas come tumbling in like leaves caught in a brisk wind. I try to catch the ones I can, write them down, then bring them to life. Each one is like a little gift. 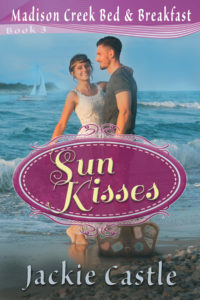 My newest book, Sun Kisses sprang from a sermon. Well, I actually had the idea churning in my mind about a woman who finally gets what she’s been praying for, but there were some loose ends that weren’t binding together. Then I heard the sermon that tied my plot and purpose all together. The pastor told the story about Elijah when he was fleeing from some evil queen (sounds like something out of a storybook, doesn’t it?) He flees into the wilderness where God provides for him: food and water until it’s time for him to move on. I knew the story says that he was fed by the ravens. What I never realized was that it was ravens that fed him. That had never really sank in as it did that Sunday morning. Now, I’m betting those birds weren’t pizza deliveries. I don’t even want to think what type of food they brought him. But the cuisine never deterred ol’ Elijah. He ate whatever they brought him and drank from that stream, and waited on God. This got me to thinking about how many times God has brought provision and I was left scratching my head and wondering if it wasn’t some kind of joke He was playing on me. Thing is, God might have a sense of humor, but he’s not mean, or cruel. And from that, the purpose of my story hit me. The when God answers, but not in a way you anticipate: do we look at it like a blessing or joke? If you’re wondering how all that ties together, I’ve put Sun Kisses: Madison Creek Bed & Breakfast on pre-order at .99¢, but only for a short time before it returns to the normal series price. Here’s a bit about the book. History drew them together and then threatened to tear them apart. Despite her attempt to portray a woman in control, Karen Borgman’s life is a mess. Living with an uncaring, unfaithful husband had been bad enough, but his death sent her life into a humiliating tailspin. Only her fight to revive for her town, Madison Creek, and sharing its deep history with tourist kept her sane. When history professor, Kevin Fairbanks, sailed into her life, Karen’s hope of a life with a good man is ignited. What could go wrong? But when her heart’s desire, a desire she could never attain on her own, is dropped on her doorstep, her reputation and relationship with Kevin are threatened. Oh, and what’s up with Haley and Ethan? As Ethan’s new business venture grows, his time for Haley shrinks until they are like two passing ships blown and tossed in a stormy sea of busyness. Another heartwarming story from Madison Creek Bed and Breakfast and the characters you’ve grown to love. Jackie Castle is the author of The White Road Chronicles a fantasy series, The Sentinel Archives for school-age readers, and newly released Madison Creek Bed & Breakfast romance series. She has also published articles and short stories in numerous magazines. She’s enjoyed many crazy adventures from working as a hairstylist, to her bravest quest: teaching children in daycare and elementary schools. Eventually, she settled down to a somewhat safer pursuit of being a Story-weaver. Now she lives in her comfortable Texas home where she spins marvelous tales and enjoys relaxing in the evenings with her husband Bob, their children and grandchild. She looks for the extraordinary in every ordinary day that she experiences. Hi Jackie, story catcher is a cool title to have:) I love the story of Elijah, especially about God being the still, small voice. The bit about the Ravens feeding Elijah has made me go back and read the story again- never noticed that detail! Hi Jackie! As a Michigander, I enjoy the Madison Creek Bed and Breakfast series. My granddaughter’s name is Maddison (yes with two “d”). Thanks for sharing your inspiration with the Old Testament story of Elijah. Best wishes and happy writing. So glad you’re enjoying the series. Sounds really interesting! Would love to read it. Thanks. Hope you enjoy it if you do read it. It’s always interesting where and how authors come up with their stories. Sounds like it will be an interesting book to read. Story catcher! What a “catchy” title for you! That seems to sum up what I think authors do, with characters and dialogue running around in their heads! This story sounds very good! Thanks. It’s interesting to hear how you came up with the idea for the story. What’s more amazing to me is how you (and all authors) are able to take an idea and fill it in with so many details for a complete novella or novel! I’ve been caught pulling out my phone during church to take a photo of the worship song on the screen so I can remember it later. It was perfect for my characters’ journey!!! This has happened more than once. Yes, I get strange looks but to the few who ask, I tell them it’s story inspiration. The rest who see me probably just think I’m strange, which might also be true! So last Sunday I was trying to listen to the sermon, but then my story popped up. A new scene!! I couldn’t lose it, so I pulled out my phone and was typing furiously to get the scene down while I could. If anyone asked, I was taking notes… of something…. they don’t need to know what exactly, right? lol. And yeah, the songs. I’d had to go to the sound booth several times and ask for a title because I was like, boom! there’s my story-song! I’ve got the book already pre-ordered and am looking forward to reading it! Always fun to hear the backstory. Very interesting how you came up with the story, it made me want to read it even more. I think often we see better God’s plan many years down the road. I agree. You know what they say about hindsight. Romantic and the setting is at a B&B? Now that is my kind of story. Sounds like my kind of story….will head to Amazon! I’ve been walking with the Lord long enough to know when He answers a prayer in a way I never expected, I know it’s the best way for me. Even if I think it’s a bit crazy! And also that His way of answering is so much better in the end. Like Merrillee said here, sometimes we can see the reason right away and sometimes not until well down the road somewhere. I do sometimes ask “are you sure Lord” but I go with it anyway :-) For me, it’s a matter of trusting His leading. Love C.S. Lewis. Such a wise man. This sounds like a great series… would love to read it! Oh wow, I’ve just discovered you, Jackie. Yes, they can be read alone. There is a long thread that goes on with Haley and Ethan, the b&b owners, but not anything that has to be read from beginning to end.